Josh Owen’s tip in with 29 seconds left proved to be the game-winner for Stanford as they upset the Huskies. With the loss of forward Landry Fields, Stanford was overlooked heading into the season with third year coach Johnny Dawkins at the helm. In Dawkins first two years, the Cardinal finished eighth and ninth in the Pac 10. This is a win that got Stanford into the bubble discussion. It’s a great home win for them against a quality opponent early on in Pac 10 play. They’ve put themselves in a good position early on in conference play after some tough losses in non-conference play. Now they have to go out and win some more games in the Pac 10. A 12-6 mark in conference play could lead to a NCAA Tournament appearance. Junior guard Jeremy Green is Stanford’s top scoring option and arguably the best shooter in the Pac 10. He scored 12 last night. The main culprit of Stanford’s turnaround has been the play of freshmen Dwight Powell, Aaron Bright, Anthony Brown and Andy Brown. Josh Owens took a medical redshirt last season due to an undisclosed illness. His return this season has been huge. He had 14 points last night including the game-winner. Virginia Tech led North Carolina 40-31 at the 15:20 mark of the second half. The Tar Heels outscored the Hokies 33-21 the rest of the way to win it 64-61. Drexel got a huge resume building win at home against Old Dominion in CAA play. Belmont is looking like a possible giant killer in the NCAA Tournament if they can win the Atlantic Sun. They throttled Lipscomb 88-52. Coastal Carolina is 6-0 in the Big South after a 74-69 win over Winthrop, a team that’s dominated the conference the last decade. Utah State beat Boise State 68-59 to move to 4-0 in the WAC. Portland won a 79-78 double overtime thriller against in WCC play. Richmond has been a bit of a head-scratcher so far this year. They lost to Rhode Island 78-74 at home in A-10 play last night. Blake Hoffarber (Min)- 26 pts, 4 asst in win over Purdue. Klay Thompson (WSU)- 36 pts, 5 asst in loss to Cal. JaJuan Johnson (Pur)- 29 pts, 11 reb in loss to Minnesota. There’s only seven games on the slate tonight. Tough road game for Butler, but I think they find a way to win. I’ll take the Broncs at home. Derek Needham and the Stags look to stay undefeated in the MAAC on the road. The Seminoles dictated a slow tempo throughout the game and a stifling defensive attack en route to an upset 66-61 home win over Duke. Seminole guard Derwin Kitchen put the team on his back. He played with fire and aggression, scoring 22 points and pulling down 10 rebounds. Duke shot just 31-percent from the field, the Seminole defense played great. The Blue Devils inside game was non existent for most of the night. The Seminoles hit five consecutive free-throws down the stretch to preserve the win. It’s the third time that Florida State beat Duke at home since 2002. The win also snaps the Blue Devils 25-game winning streak. No. 2 Ohio State and No. 3 Kansas didn’t play their best basketball, but both won winnable road conference games in narrow margins. The Buckeyes defeated Michigan 68-64, and the Jayhawks took care of Iowa State 84-79. No 6. San Diego State did what it had to do, win at home over UNLV in Mountain West play 55-49. How about Colorado, a sleeper in the Big 12, picking up a nice road win over No. 20 Kansas State 74-66. No. 13 Texas A&M destroys Oklahoma State at home 71-48. YOOOAdrian’s NCAA Basketball Recap from 1/11/11- Did Michigan State Finally Turn their Season Around? Is this the win Michigan State needed to turn their season around? 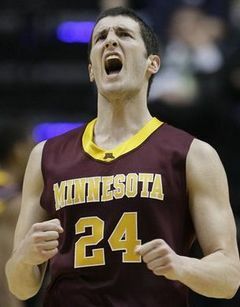 They picked up a huge 64-61 nailbiting overtime win over Wisconsin on Tuesday night. Wisconsin was 34-1 when holding a lead with under 4:00 to play. With 2:39 to go Wisconsin held a 51-43 advantage. They turned the ball over three times in the final minute which led to the Spartans tying the game at 53 and forcing overtime. 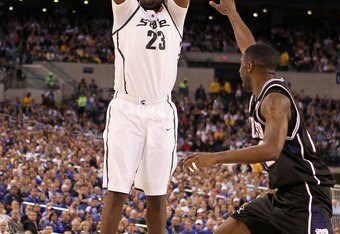 The Spartans Draymond Green is still shooting a lot of jump shots, but tonight he got to the rim more often. He scored the first eight Michigan State points in overtime. He finished the game with 26 points. Michigan State guard Kalin Lucas started slow and dealt with foul trouble, but he made some key plays down the stretch. He was aggressive as he slashed to either get to the tin, or dish it off to an open jump shot. He had 17 points and six assists, but was just 4-for-17 from the field. Michigan State forward Delvon Roe did a great job on Wisconsin’s leading scorer Jon Leuer had just 10 points on 3-of-9 shooting. Wisconsin center Keaton Nankavil did all he could. He scored 17 points, knocking down five of his six three point attempts. Andrew Jones’ putback with .7 left gave the Nittany Lions the win. Illinois better start hitting the glass if they want to be successful in the NCAA Tournament. They were out-rebound by Penn State 33-27. Talor Battle is quickly becoming this year’s version of Maryland great Greiviz Vasquez; a player who can let it fly from anywhere on the court. And make them! With the shot clock running down midway through the second half for Penn State, Battle stood at the top of the Penn State decal basketball in hand. He set his feet, launched, and split the strings! Bryce Jordan Center exploded! Battle had 26 points on the night, 4-for-9 from three. Tenth ranked BYU’s Jimmer Fredette had just 47 points in a 104-79 win over Utah. No. 9 Connecticut and No. 14 Kentucky both had convincing wins at home against inferior conference opponents. The Huskies beat Rutgers 67-53, Kentucky trounced Auburn 78-54. Tennessee falls to 0-2 in the SEC after a tough 81-75 overtime loss at home to Florida. The Gators on the other hand go to 2-0 in the conference. No. 14 Texas and Baylor pick up convincing Big 12 wins over Texas Tech and Oklahoma respectively. How about Boston College and the job first year head coach Steve Donahue (former Cornell coach) has done. The Eagles start 3-0 in the ACC after a 75-66 home win against NC State. Jimmer Fredette (BYU)- 47 points in a 104-79 win over Utah. Talor Battle (PSU)- 26 points in a 57-55 upset home win over No. 16 Illinois. Reggie Jackson (BC)- 29 pts, 5 reb, and 6 asst in 75-66 win over NC State. We had a bit of a role reversal in this one; Marquette was the squad who was golden from downtown. Usually it’s the Irish who flourish from deep. Notre Dame had open looks from beyond the three-point line all night, but the shots simply didn’t fall. The Irish shot an abysmal 3-of-18 (18.8%) from downtown as Marquette destroyed Notre Dame 79-57 Monday Night. Jimmy Butler and Dwight Buycks both did a fantastic job of defending the shooting tandem of Tim Abromaitis and Ben Hansbrough. Buycks and Butler did a terrific job of not letting Abromaitis and Hansbrough catch and shoot. Abromaitis had ten on 4-of-8 shooting, just 1-of-3 from downtown. Hansbrough scored a measly nine on 3-of-9 shooting. In defeat, the Irish have solidified themselves of having a point guard of the future. Notre Dame started Reggie Smith at the beginning of the year, but Eric Atkins has earned the starting gig. He has great vision; he’s currently 10th in the country in assist to turnover ratio. Atkins needs to hit the weight room though if he wants to matchup with the rest of the physical point guards of the Big East. Buycks wasn’t too shabby on the offensive end either. The freshman scored a career-high 21 points. He was a perfect 5-for-5 from beyond the arc. He was a prescensce in the post all-night. He consistly got potioning on the block offensively, and was swatting shots defensively. Arkansas Pine-Bluff was a tournament team as a 16 seed last season. It took them 15 tries to finally pick up their first win of the season. The great news for the Golden Lions is that they are just two back of first place Jackson State.